Musée de Tahiti et des îles – Te Fare Manaha is a territorial public institution which opened its doors on the 7th March 1974 by decision of the Territorial Assembly. On the 30th March 1977, three out of four permanent exhibition rooms were opened to the public, before opening completely on the 30th June 1979. At the time, the museum was part of the Polynesian Centre for Human Sciences (C.P.S.H – Te Anavaharau), alongside the archeological and oral traditions departments. When the C.P.S.H closed in 2000, the museum became an autonomous administrative public institution called “Musée de Tahiti et des Iles – Te Fare Iamanaha”. 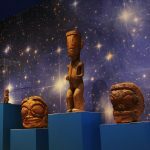 Five years later, the museum took its current name “Musée de Tahiti et des Iles – Te Fare Manaha”, alluding to both the existing relationship between Tahiti and the other 118 islands of French Polynesia, and the Polynesian traditions it is anchored in as “house of hidden treasures”. 15 km away from Papeete, the museum is located on a site called ‘ôutu Nu’uroa, in Punaauia. Between the mouth of the Punaru’u river and the end of Punaaui’a’s land, the site was called Burder’s point by missionaries, before being nicknamed the Fishermen’s cape (“Pointe des pêcheurs”). As situated on the Atâhuru chiefdom, Nu’uroa’s cape was a prestigious place. The Te’eropa’a tribe led the lands of Temanotahi and Temanorua, now known as Punaauia and Pa’ea. Until the arrival of the first explorers in 1767, Nu’uroa remained the location of the greatest religious site in Tahiti. 1815 marked the date of the Fê’ipi battle which, following the victory of Pômare II, was synonymous of the end of the ancient religion, the loss of ‘Oro’s veneration. Once settled in 1819, the London Missionary Society’s members D. Darling and R. Bourne built a temple, a school and a printing press, which produced the first Tahitian grammar later in 1823. From 1844 to 1846, Punaauia endured the military conflicts of the French-Tahitian war, until its surrender. A high tower was thus built at Nu’uroa, while two small forts marked the entry of the Punaru’u valley. Opposite to the Musée de Tahiti et des Iles – Te Fare Manaha stands the world-famous surf spot Sapinus. The institution’s role includes the acquisition, conservation, restoration, reproduction and presentation to the public of collections related to Oceanic and specifically Polynesian heritage. The museum can run or take part in cultural events. As an organization in charge of the enhancement, study and diffusion of this heritage, the museum acquired a real expertise in the preservation of cultural material and movable goods. Today, it is the main institution of French Polynesia to gather both Polynesian natural and cultural treasures. Situated in a three hectares garden, on the Nu’uroa’s cape in Punaauia, the Musée de Tahiti et des Îles – Te Fare Manaha also offers a botanical itinerary.